nobookerycookery | Making stuff up in the kitchen. Making stuff up in the kitchen. Truth: If I were a character from Kung-Fu Panda, I would be . . . Tigress? No . . . Oogway? No . . . Tai Lung? No . . . It’s Ping. 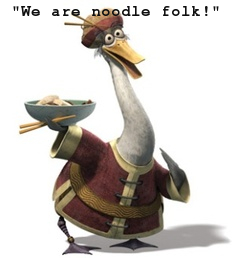 I’m Mr. Ping. And Sunnybuns, my oldest, is the noodle-dreaming progeny Mr. Ping always dreamed of. Broth is in out veins. Which is why low carb/paleo/gluten free/wheat avoiding/whatever is so hard sometimes (and why I just don’t sometimes)! House brand gluten-free pasta showed up in my small-town Kroger not too long ago, and for only 250% more than regular! It sounds like such a deal when I put it that way. I checked the label. Rice, corn, and a concoction of phosphates. Hmmmm. After two months of thinking about it (“Which is better, whole grain or gluten free?”), I slapped a package in my cart. They cook up like wheat noodles, not rice noodles, but as you can see from the picture, this pasta has the same translucent quality of rice noodles, and you can definitely smell the corn. The starchy breakdown process happens quickly, so stay well to the safe side of al dente, or you’ll get sticky mess. Verdict: This was very decent pasta–not weird at all. If it’s worth the extra cost to be gluten free, I recommend them. We are eating so much less pasta nowadays I just might make a full conversion. Oh! And the Easiest Pasta Sauce Ever? Pour the hot, drained pasta back into its cooking pot. Stir in honey, mustard and garlic to taste. The end. Seriously, twisting the lid off a new jar of marinara is way harder. Obviously, you can add veggies and proteins as desired. I think my family members deserve fancy blog names. From hence forth they shall be known as Sunnybuns (my six-year-old Ponyo clone), The Captain (the four-year-old tyrant who rules supreme), and Suspect #9 (my hairier, more paranoid other half). Besides yellow salad tomatoes, the only other thing growing in my garden is pumpkins. I couldn’t be happier about that. They are not quite ready to cut off the vine, but the burgeoning orange glow I can see from my kitchen window has pumpkins on my brain, so I popped open a can. First, I poked holes in the middle of pumpkin biscuits and convinced The Captain they were donuts. The next morning when she wanted pancakes I thought I’d do a little dabbling and see if I couldn’t come up with something even healthier. I’ve had success with the family of paleo pancakes that are essentially fruit-flavored circular omeletts, such as these blender banana pancakes. Hm, thought I, bananas are often used as a fat substitute in baking, and pumpkin can be used in the same way. I bet I can do a one-for-one swap no problem. 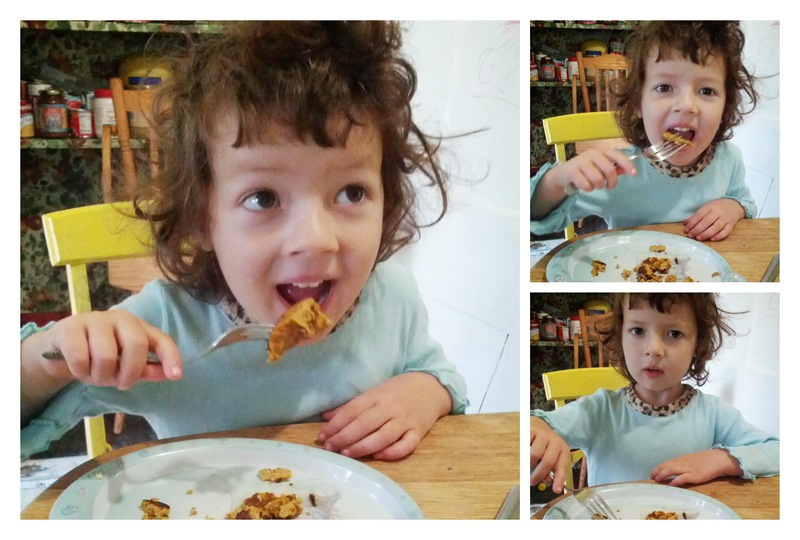 Thus the Paleo Pumpkin Pancake was born. It makes so much sense, I doubt I was the first to come up with it. My Gimp-Fu is maturing, but I am still a Padawan. I looked up the Banana Pancake recipe after I created this image, and the number of eggs is not what I remembered. I’m pretty sure I did use five in my Pumpkin version, but I’m also pretty sure it won’t matter. It’s the kind of recipe where almost definitely counts. I didn’t measure a thing. For the sake of science, I tested an oatmeal option as well, just a small handful thrown into the blender. I would show you an image, but I found a typo in it. Luckily, before I sent it out into the world. The oats added heartiness, fill, and nutty flavor. These pancakes are a solid 4 stars, given what they are. 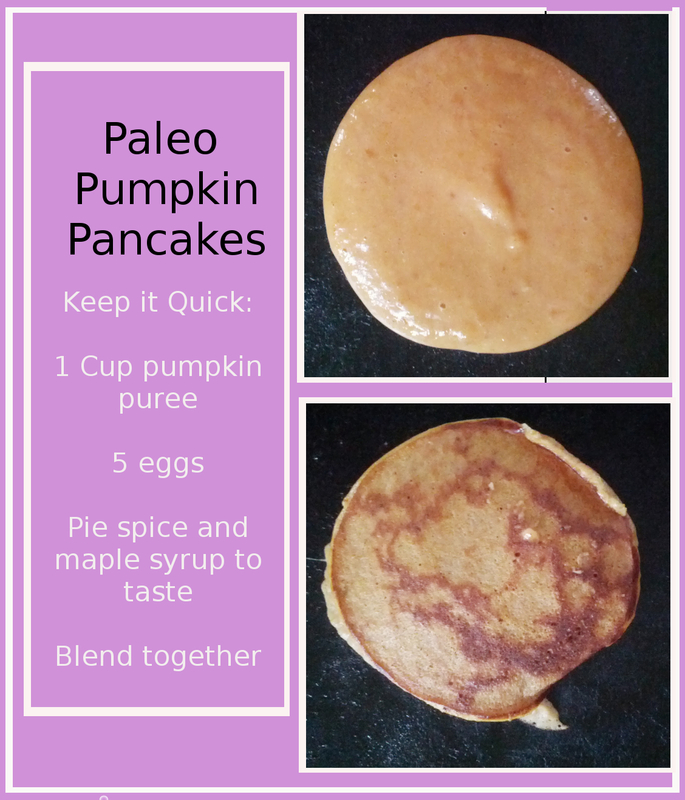 If you like your pancakes light and fluffy, I’m not sure any Paleo or Gluten Free variety will really do for you. If you never met a pancake you didn’t like, these will be a fun change of pace. I like my pancakes dense and squidgey, and I thought these were delicious. Now, what to do with the half-can of pumpkin I still have left over? You should start a cooking blog, he said. It will be fun, he said. Huh, thought I, He’s always right. I bet it will be fun. So I packed my camera phone along when I made dinner that night. I thought taking the pictures would be the hard part. One of those looks-like-a-cookbook-cover food photos you see on Pinterest! (Hint: Pin it, will you?) Yes, I still have a lot to learn about photo editing. Installing the software was not the hardest part. 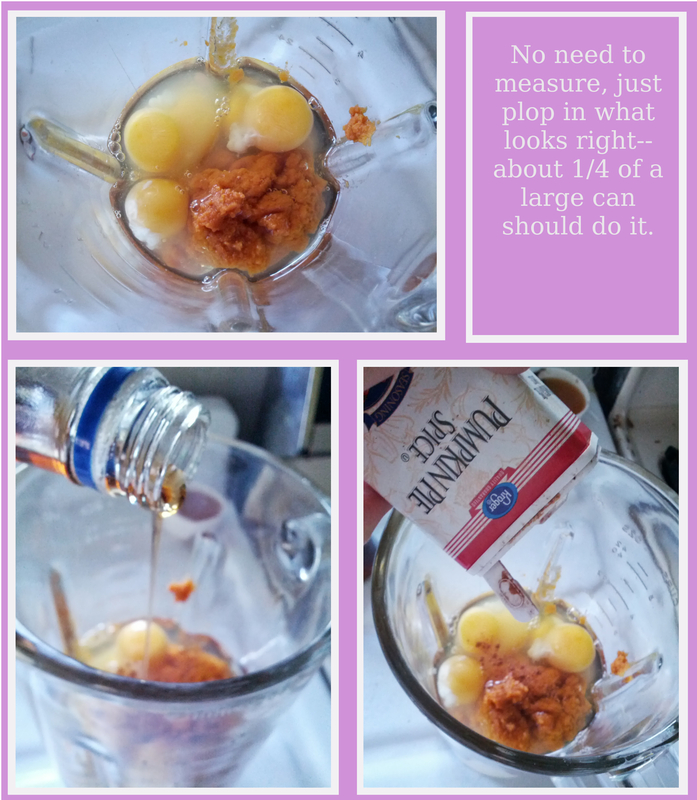 But here I am, writing my first post, and I should explain what nobookerycookery is all about. I love trying new recipes, out of glossy photo-filled hardcover cookbooks, magazines off the free rack at the library, or more frequently off my social networks. But sometimes, after a long day keeping up with the husband, house, and kids, or after a long night laying awake for no reason, my brain can’t wrap itself out around all that close reading and measuring that must go on if one is to follow a recipe. Or sometimes I have something particular in mind, and I can’t find a recipe that tells me the right way to go about it. Or sometimes I haven’t been to the grocery in over a week. For whatever reason, I often end up tossing handfuls of this and that together, and sometimes the end result is actually decent food. As I pondered what kind of cooking blog I should start (I’m really into special diets. I follow all of them on alternating days), I realized those necessity-driven creative moments are what I most want to talk about. Which brings me to dinner two nights ago. I hadn’t harvested my yellow salad tomatoes for over a week, and the fruit was starting to drop and rot on the ground, and the guilt was starting to prick at me. The last time I picked tomatoes, I roasted them in big batches, not being extra careful about crowding them in the pans, and the results swam in intensely flavoured soupy juice. I knew I wanted to try cooking the next patch with something that would soak up all yum, and I had bought chicken quarters at 89 cents per pound, so the obvious combination was a tomato enhanced baked chicken and rice. 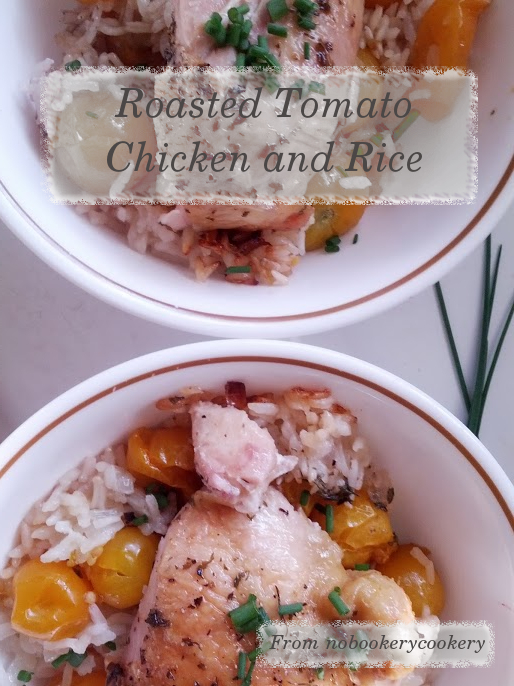 I scoured Pinterest, but, try as I might, I couldn’t find a recipe that relied solely on the juice from the chicken and tomatoes to cook the rice. I would have to come up with something on my own. What I envisioned: Pillowy rice, the bottom crusted by chicken drippings, studded with golden tomatoes and topped with crispy skinned chicken. What I expected: A soggy burnt mess. Here’s what I did, and in keeping with the nocookerybookery form, I won’t write it out like a recipe: Sautéed one diced onion in heated oil in an oven proof skillet, added one scoop of rice (I used a tea-cup, which is about 1 and a quarter cup when brimming, but precise quantities are not the thing here) and let it toast a bit. Then I added two handfuls of tomatoes in a layer and topped it all with two salted, peppered, and herbed chicken quarters. I don’t know what herb. It was green and smelled good. At the very last, I got nervous and splashed about a quarter cup of water into the pan: just something to keep the rice from burning while the tomatoes and chicken commenced juicing. It all want into a 400 degree oven for one hour. The result: I give myself a 3.5. This definitely has merit. The rice absorbed the juices and created a chewy-crunchy edge that I had to force myself to share with anyone else. But the flavor was too intense, the tomatoes took over everything. The husband figures some grated parmesan added at table would round the whole thing out. How’d I do? Do you want to try it? What would you do differently? Be gentle with me, it’s my first time. Three Carbivore Girls on a Gluten-Free Quest!